1. Entries will be accepted from anywhere around the world, however, travel costs will not be covered by Currumbin Wildlife Sanctuary. 2. Information on how to enter and the prizes form part of these Terms and Conditions. Participation in this promotion is deemed acceptance of these Terms and Conditions. 3. Employees (and their immediate families) of the promoter and agencies associated with this promotion are not eligible to enter. Immediate family means any of the following: spouse, ex spouse, de-facto spouse, child or step-child (whether natural or by adoption), parent, stepparent, grandparent, step-grandparent, uncle, aunt, niece, nephew, brother, sister, stepbrother, step-sister or 1st cousin. 4. Currumbin Wildlife Sanctuary reserves the right, at any time, to verify the validity of entries and entrants and to disqualify any entrant who submits an entry that is not in accordance with these Terms and Conditions or who tampers with the entry process. 5. The competition commences 4pm on 14 May 2018 and final entries close at 9am on 4 June 2018 AEST. Currumbin Wildlife Sanctuary will select the winner within 2 days of receiving the final entries. The winner will be notified within 2 days of selection via facebook. 8. The winner will be selected based on their answer. 9. All decisions are final and no correspondence will be entered into. Currumbin Wildlife Sanctuary accepts no responsibly for lost, late or misdirected entries. Entries will be deemed void if forged, inappropriate, offensive. 11. 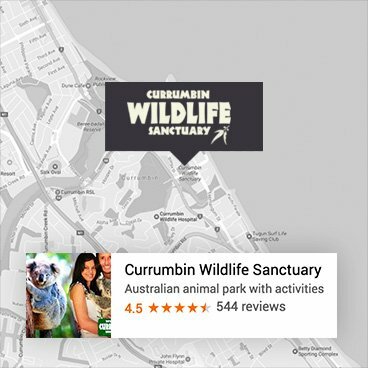 By entering this promotion, the participant grants Currumbin Wildlife Sanctuary and its licensees and assignees a non-exclusive license to exercise all rights in perpetuity throughout the world for the entry at any time. This includes, but is not limited to, the right to display take photos and video and showcase in whole or in part in any media, including on the Currumbin Wildlife Sanctuary Facebook page. The participant acknowledges that they will not be entitled to any compensation for this continued use. 12. This competition is in no way sponsored, endorsed or administered by or associated with Facebook. Entrants release Facebook from any and all liability resulting in this competition.